There is a lot to love about contemporary furnishings and décor… sleek surfaces, clean lines and sculptural forms. But it can be intimidating to incorporate the look into a Mediterranean home. 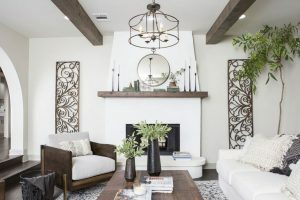 Including some of the latest trends is a great idea for increasing the value and appeal of your home… but it does not have to be a complete remodel. Changing out some furniture, lighting and color can just be enough to reinvent the space. Less is more in contemporary design. Keep your accessories simple and fewer. They should be well-chosen for their statement and wow factor. Keep the color palette light and neutral. If there is crown and base molding, make it white. The same goes for the doors and casings. There are beautiful shades of grey, taupe and white (yes, shades of white!) That would make a beautiful backdrop. Utilize the recessed lighting if your home has it, as opposed to too many lamps. A combination of the two will give you general and ambient illumination. Mix and match furnishings and light fixtures… if the furniture is more traditional, use contemporary lamps and if you have a fancy chandelier, combine it with a contemporary table and chairs. Swap out the heavy draperies and cornices for light airy fabrics on a rod. Shutters and solar shades are another great option. Reupholster older pieces with more contemporary fabrics and keep it all very neutral. Save the big pop of color for pillows and accessories. You might take a lead on the latest color trends by checking the Pantone Color of the Year. Add a new cocktail table and end table. You will make your home more interesting if you mix the old with the new. Art and area rugs are another way to introduce a current modern look. 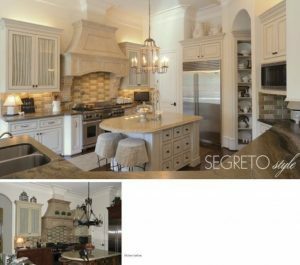 Paint or refinish dark cabinetry to a lighter tone or very dark (expresso) and replace the hardware with a sleeker style. Think of changing out the raised panel doors and drawers for a flat slab style. One of the easiest ways to modernize your home is with technology. Whether you go fully automated or specific, a first step is WiFi and Audio/visual. Simple changes like light switches and receptacles with USB ports are small but will make a difference. Replace carpet with porcelain tile, engineered or hardwood flooring or stained concrete. Maintaining a consistency of flooring throughout will make the house flow and appear larger.